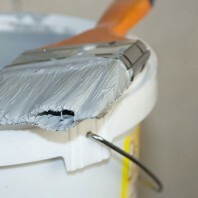 Most people are familiar with that “new paint” smell. What many people don’t realize is that underneath those freshly-painted-fumes lies a host of toxic chemicals called VOCs (volatile organic compounds). While some VOCs are greenhouse gases being released, others are simply toxic to humans and bad for your health. Paints, stains, and solvents all typically contain VOCs, and the EPA has found concentrations of VOCs indoors to be 2 to 5 times greater than outdoors. In an effort to improve the health of our clients, as well as our planet, Sierra Precision Painting chooses Low-VOC paints whenever available. This not only reduces everyone’s exposure to these volatile chemical compounds, but also helps preserve the environment for future generations. If you’re interested in learning more about what Low-VOC products are available for use on your project, please ask us during your consultation.